View Part 1 of this article. After negotiating the Brenner Pass, the lowest pass in the Alps, the way descends on a shared walking and cycling path on a former railway line. Many of the old railway buildings associated with the line are still there, evidence of the history of the way. 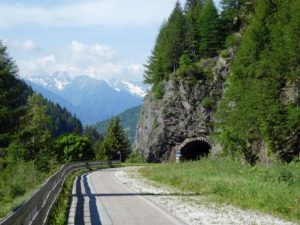 The ascent over the Brenner Pass, though not long, is steep and, lamentably, from the last village in the valley follows the road. At first this road had a reasonable verge, but as I climbed the verge got narrower. My notes declared that the road was fairly quiet during the week but unfortunately I was walking it on a Saturday – and it wasn’t quiet! With only a few kilometres to go to the Brenner See, for my safety, I hitched a ride in a paddy wagon. The young police officers were kind and polite, dropping me at the bridge leading to the path and enabling me to complete my ascent. 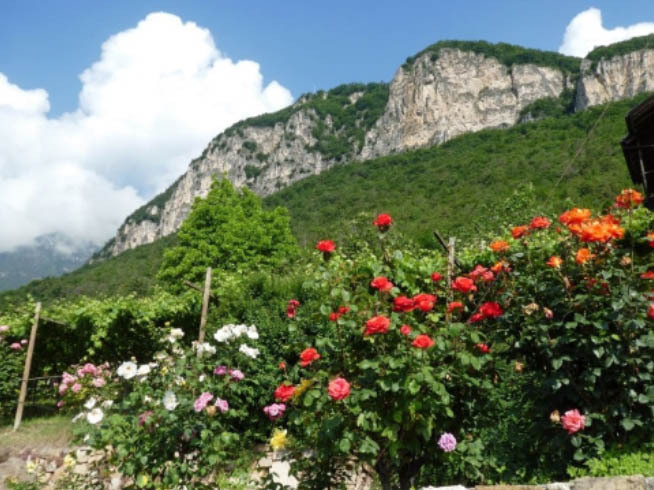 Brennero, the village on top of the pass, hosts not only former border controls, cafes, and several historic chapels, but also numerous outlet stores focussing on outdoor clothing! Heading down from the pass the valley is very narrow with the cycling path, a local road, the major highway and a busy train track all jostling for space. Even though the path was generally descending there was plenty of climbing too as it crossed from one side of the valley to the other and was almost always much higher, often overlooking the roads and train tracks on the valley floor below! The Italian Tyrol is a delightful place, with small compact towns and villages along with spectacular scenery. The towns in this region have both an Italian name and a German one, creating confusion at times. Though German seems to be the default language used it is also a place where there is much less English spoken compared to across the border. 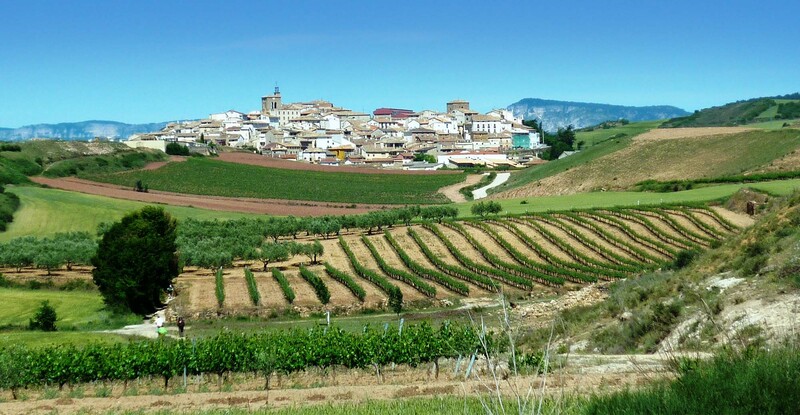 This is another important wine growing region, with terraced vineyards on the steep hillsides. It is a very beautiful region with white, often sheer faced, hills towering over the vineyards on the lower slopes, and the horticultural enterprises on the valley floor itself. 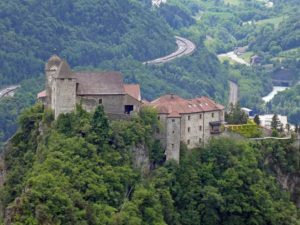 In the South Tyrol the path descends to the town of Chiusa (Klausen), situated on the Isarco River (see photo p.10). 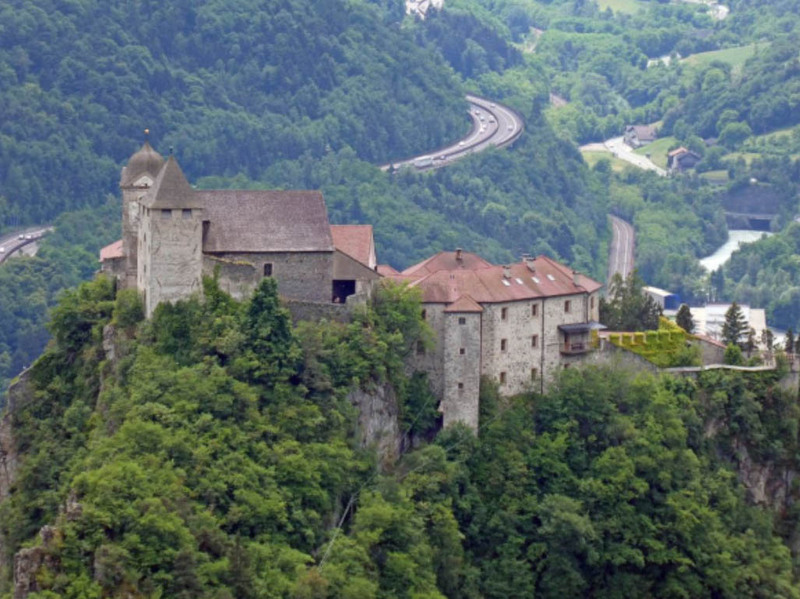 Overlooking the town is the Säben Abbey, a Benedictine Convent established in 1687, through which the path passes on the way down the steep hill on which the convent is perched. A few days later the path passed a UNESCO world heritage site, the Earth Pyramids, on the outskirts of Collalbo in the Renon region of the South Tyrol. 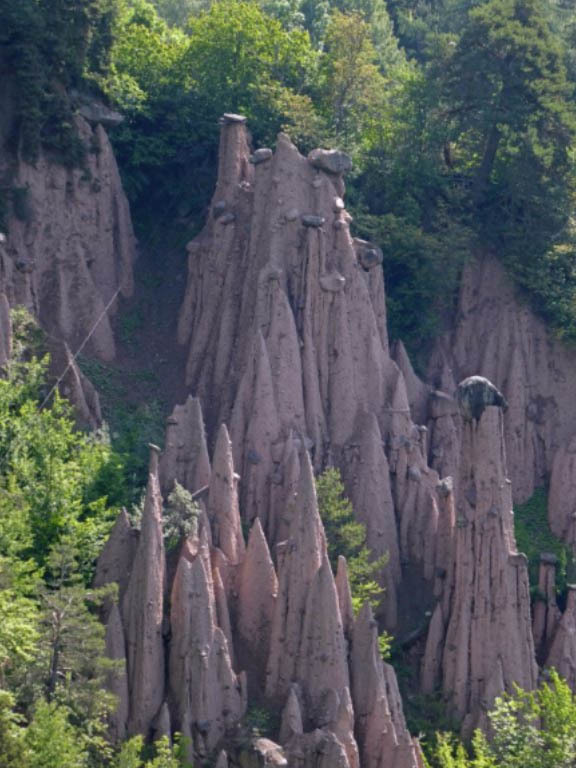 The earth pyramids are a natural formation, constantly changing due to erosion, where morainic rock is slowly eroded away leaving a rock ‘cap’ which protects the column for some time until erosion finally causes its collapse. Later that day, at Soprabolzano, there is a choice. Either to walk around 14kmswith a knee-punishing descent to Bolzano/Bozen, or catch the new cable car – a ride of around 12 minutes complete with stunning views. Needless to say I chose the latter – arriving with knees intact is a bonus! Continuing down the valley, with the magnificent Dolomite mountain range towering off to the right, the path passes through the village of Tramin/Termeno. 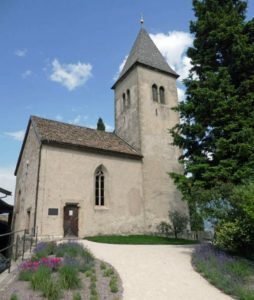 It is here that I investigated the small chapel of St Giacomo (St Jakob/St James), set on a prominent hill overlooking the broad Valley of the Adige. This small church has some wonderful frescos inside. The fresco that stood out for me because it was so obviously related to St James was the one that told the legend of the young pilgrim in Santo Domingo who, unknowingly, had pewter hidden in his luggage, subsequently accused of theft, hung as a result pf these accusations, and then miraculously survived. For anyone planning to start in Brennero it would be a mistake to think this was the easy part. The constant steep ascents and descents make these first few weeks of the Italian leg arduous. This part of the way passes by the spectacular Dolomite Mountains. Once leaving the Dolomites however heading towards the River Po, the terrain changes dramatically becoming flat, hot and humid. 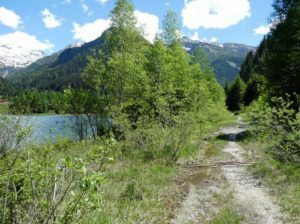 On leaving the Tyrol, and the Dolomites (at Bassano del Grappa), the path flattens for a few stages as it heads towards the historic centres of Padova (Padua), Ferrara, and Ravenna. 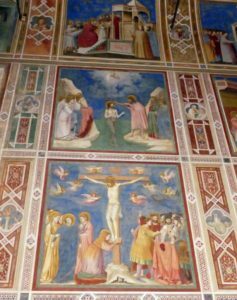 Padova has a number of beautiful churches, two dedicated to their patron saints – Saint Anthony in one and Santa Giustina in the other. Saint Anthony was buried in Padova and born in Lisbon, where many start the Camino Portuguese, and each year in that city the Sardine Festival is held (12-14 June) in celebration of the Feast of Saint Anthony. Padova is the city where the Cammino di Sant’Antonio begins. 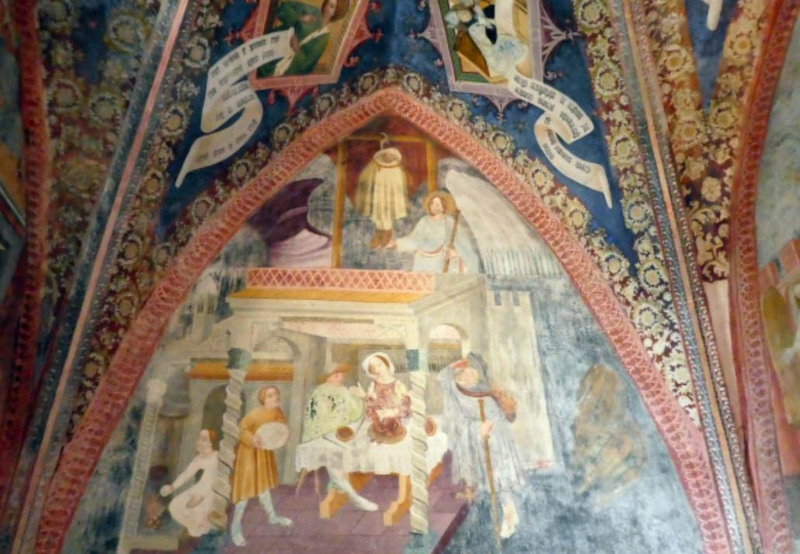 It is also a place where some spectacular frescos can be seen. 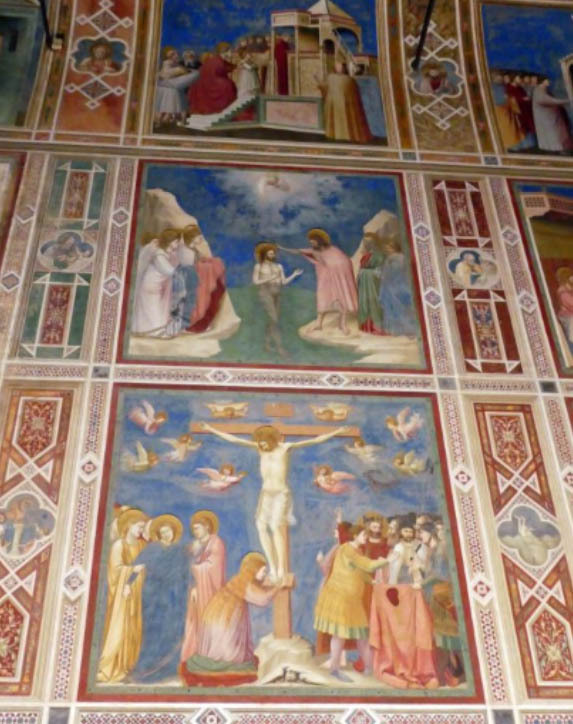 The frescos, painted from 1303 to 1305 by Giotto, are in the Cappella degli Scrovegni which is attached to the former Augustinian Monastery, but is now a Museum. Reservations must be made to see the frescos which were meticulously restored at the beginning of the 21st century, and are well worth a visit. 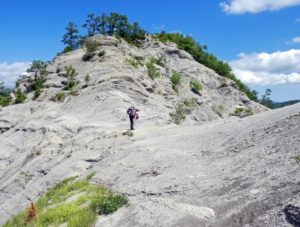 Having descended from altitudes of around 1350 metres, the stages around the Po River are very low – Ferrara at 9 metres, and Ravenna at 4 metres. It was at Ferrara that my friend Jill joined me for a couple of weeks. Ferrara is like the cycling capital of the region, with people of all ages riding bikes of every vintage. Leaving Ferrara, we walked against a constant stream of cyclists, people heading into the city to carry on their daily activities, while we were starting our journey to cross the Apennines. 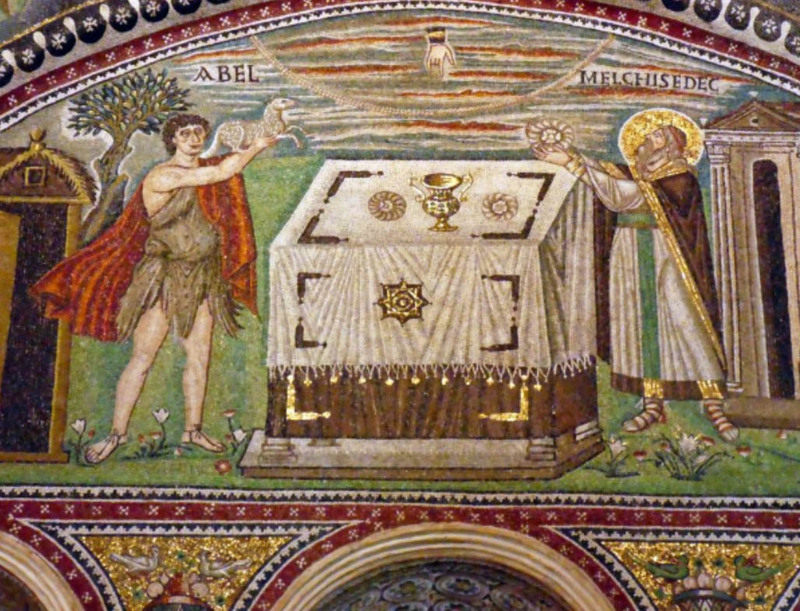 Ravenna is a must see city on this way. It has eight UNESCO world heritage sites, all of them with outstanding examples of mosaics from the Byzantine era. We paused here for three days so that we had plenty of time to see these extraordinary sites. By co-incidence we had also timed our arrival in the city with a month long music festival and so each night we attended a concert. 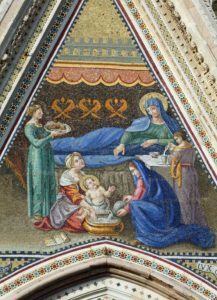 What a treat – to sit in the beautiful Basilica San Vitale, looking at the wonderful mosaics, and listening to beautiful medieval music ringing around the vast space each evening was a special experience indeed. 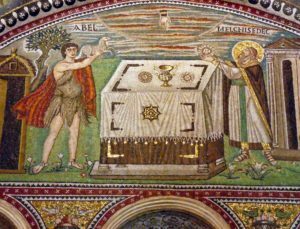 Following our rest days in Ravenna we headed inland towards the city of Forli and the Apennine Mountains, which were to be crossed, before heading to Rome. 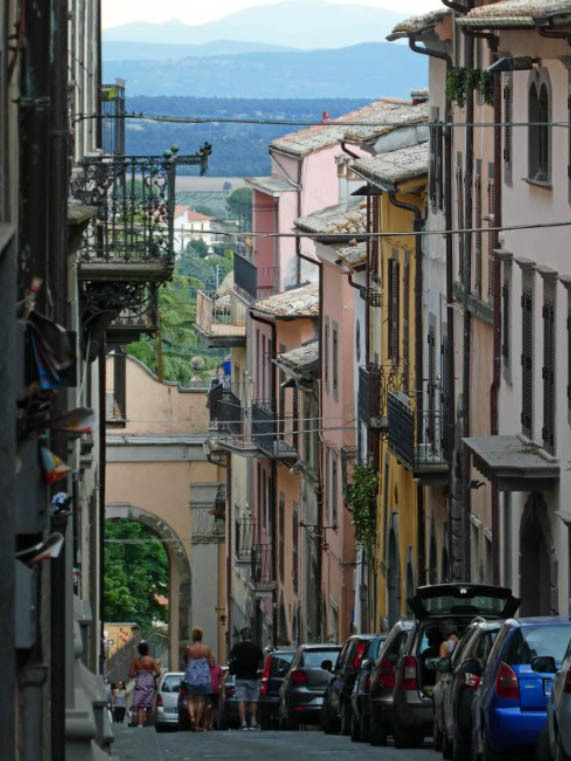 After Forli we started to do some steady climbing passing through delightful villages such as Galeata, Cusercoli (where we stayed in a pilgrim albergue in a castle), and then the spa town of Bagno di Romagna. Here we had a slippery descent into the valley due to drizzly rain, stopping to make sure a dog that had led us down the hill but refused to leave, was safe. A friendly, helpful, farmer tied it up and called the owner. It was here that we began what was the most strenuous part of the journey, and potentially the most challenging. It began quite pleasantly leaving Bagno at an altitude of 339 metres, but then steadily climbed up to around 1,500 metres to the Serra Pass. The path followed, at times, an old Roman mule track described in our notes as a masterly work of ancient engineering, but the trickiest part was around the half way point, just past a gentler slope near Nasseto where we had to cross a potentially treacherous stretch of slippery, sloping, shale like rock. We could have followed a detour, but because it was fine and sunny with no wind we decided that this stretch must be safe to cross (a warning sign said not to do it in wet, icy, or windy conditions). Nearing the halfway point along this ridge I began to have a few misgivings that this was perhaps the silliest thing I had done on any of my pilgrimages, however there was nothing for it but to creep forward taking care with each step. We even resorted to removing the rubber stoppers off our poles to provide more traction, something I have rarely done in the past. 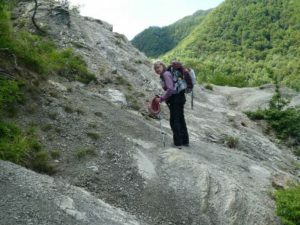 The Serra Pass is the oldest pass on record in the Apennines, with archeologists finding Neolithic tools, and pottery shards from Etruscan and Roman times. From here the path follows the ridge staying well over the 1,000 metre height with the accompanying spectacular views through the trees. This stage was, for me, the toughest on the whole journey, and at the end of a tough day there was a climb over the beautiful Mount Calvano before reaching the spectacular destination of Santuario la Verna making a total distance of over 24 kilometres for the day. 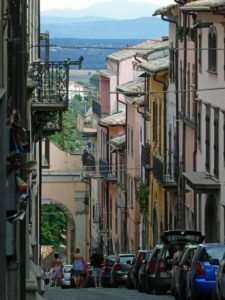 Having completed the wildest, and hardest, part of the journey Jill and I made our way towards Arezzo which we reached a few days later, passing through delightful Tuscan villages on the way. 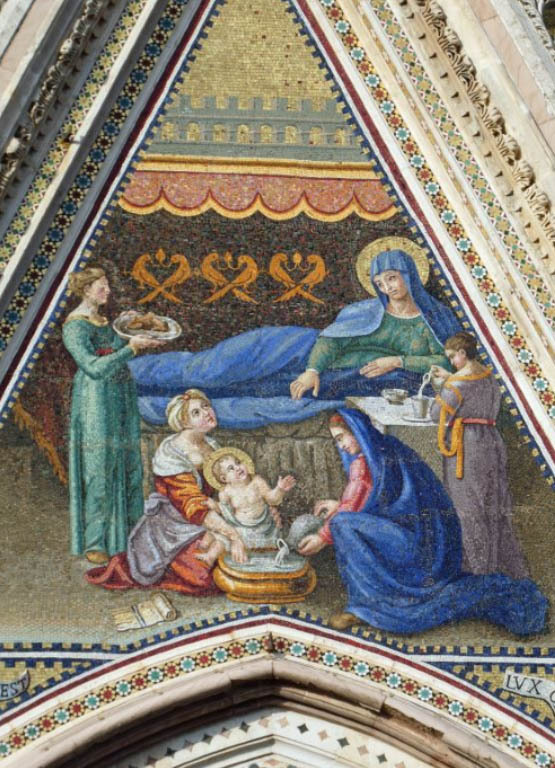 Here she departed for home and I continued on towards Orvieto and then Rome. At times the path on this stretch was in need of maintenance, but I always managed to find my way and negotiate an alternative way where the path was too overgrown to follow. 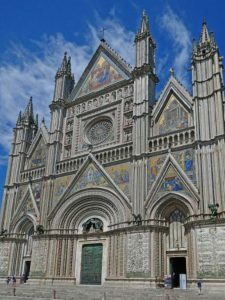 Orvieto is built on a Tuff cliff, with over a thousand caves underneath the city. 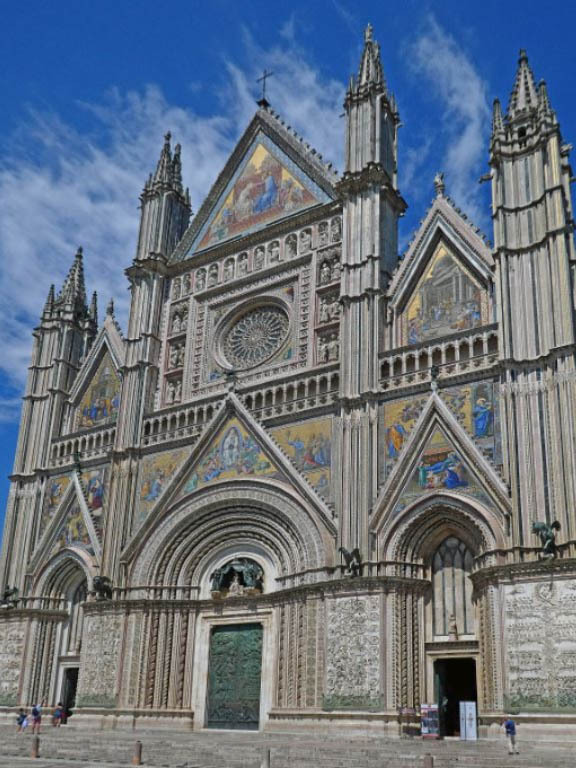 It has some fascinating landmarks including the Duomo with vibrant mosaics on its façade, and the famous Pozzo di San Patrizio (St Patrick’s Well) which has a double helix staircase (248 steps on each one) and 70 arched windows. 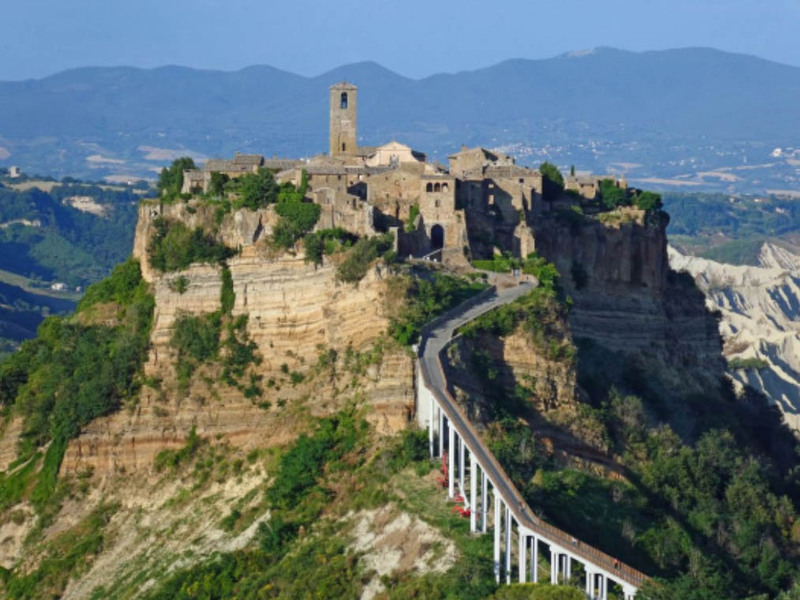 Not far from Orvieto the path passes by the dying village of Civita di Bagnoregio, a village that is connected to terra firma by a foot bridge, and is slowly being eroded away. 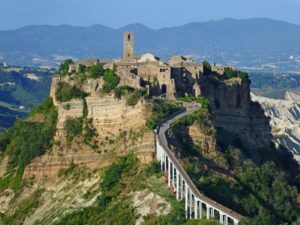 After leaving this region the path heads towards the hilltop town of Montefiascone where it combines with the Via Francigena. 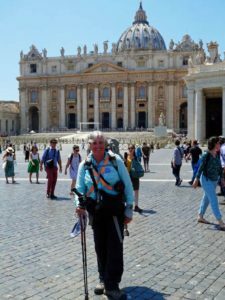 Though there were at least 6 other pilgrims on the way from this point I only saw one other for the five days it took for me to reach Rome. This is a wonderful way, very much a road less travelled. 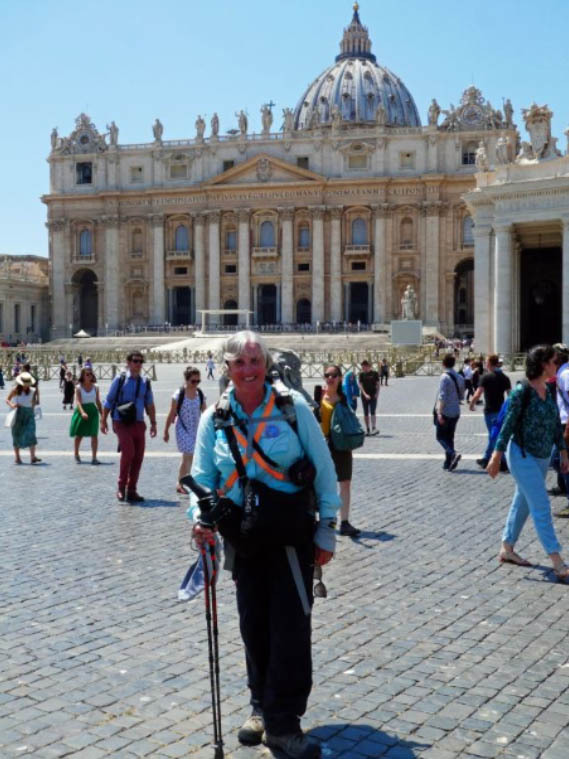 On the whole 2,200kms I met two pilgrims who were crossing my path and heading to Santiago, I met one pilgrim heading the same way as me, and a few days out of Rome I met about 5 pilgrims walking from Rome to Santiago on different routes. There seems to be a moderate amount of pilgrim accommodation at the beginning and end of the way, but, in the central part, considerable funds are needed to pay for (sometimes expensive!) hotels. I left Stade in late spring. It was cold on many days, but it was easy to get warm walking. I arrived in Rome in mid-summer along with heat, and humidity. Because of the length of the path it will always be tricky to find the best time to walk – I allowed 4 months to cover the 2,200kms. This way is peopled with many kind and generous folk. This, for me, made the way a very special route indeed. For those prepared to walk a solitary route, with much to see along the way, this is one that I would highly recommend.